- Bi-directional servo control direct drive w/ linear drive motor. - Dynamic servo tracer tonearm. - Automatic record size and speed detection system. I bought this 'table new nearly 20 yrs. ago on a lark...it looked cool, but was direct drive (my critical listening is done with a SOTA). Fast forward a few decades and I'm now digitizing my 2,000+ LP collection and this deck is ideal. The automated features make the process very easy. Using an AT 440MLa. I've owned this table since 1996 and I gotta say I'm very impressed. All the reviews are accurate. So I'm not to be redundant. The table, (if you can find one) would make a great addition to anyones stereo system. With the right cartridge, (I have an Ortofon MC 3 Turbo) will provide a great stereo sound reproduction that stands up to turntables costing thousands of dollars more. I know I've compaired. It tracks warped records very well, has a "whisper quiet" direct drive motor that is a little "low torque," or on the weak side, but this machine holds up. Attractive, solid, and well built, it is a gem! -Quiet FULL automatic servo arm functions (can locate arm left or right to find that special section of a track you want to hear with button controls)...Also, if you hit the start button while the turntable is playing a record in the middle, arm will automatically reset to the beginning of record without having to stop. -Tracks warped or off centered-pressed records with no problem (however, large and unusual warps will get caught on the back end of the tonearm collar). -Sounds like a very "polite" and clean analog deck sporting convenient electronic control features. Quiet or extremely low black background noise level. -Looks right at home,even with today's stereo systems...The DP 47F retains some nice hefty and classy looks with it's faux cherry/rosewood plinth. -Awkward angled backend tonearm collar that will not allow large warps on a record to pass through with ease---will cause arm to skip. -Not a dj type manual turntable where you can just grab the arm and drop it anywhere----but then again, why would you??! !---Just enjoy the smooth ride. Yes, this particualr model I have is from the mid 80's (later models into the 90's came with the black trim bezel, black brushed aluminum buttons, and black tonearm assembly). My point being that this mid 80's Denon DP 47F I own is a testament to how the company put a lot of thought and ingenuity into this deck as a final homage to full automatics of years passed. This is one durable 'table! Not slow sound thought not controlled like other high end stuff. Ok palpably and easy set up. Stable and well made. I like the look! None at this price really. Hi This is a funny TT. It looks quite Star Wars fashioned with it's robot controled tonearm. In other words, I did not even thought that this was a decent player. I was wrong! I had one in my room up for sale suited with a DL-160 cartridge. At the same time I owned a Micro seiki DQX-1500 with MA-505 arm. I put on an Audio Note Soara Japan cartridge and the best step up in the world, The Super Nova! Now the Micro had some of the best analog ever built to make a top performance, at least that was what I thought... The Micro was incredebly bad sounding, I was stunned! For comparison, I was curios, I smacked the Denon on with it's cheap high output cartridge without Nova. It simply killed the other set up!!! This is not, that the Denon must be that good, but, it's amazingly good compared to a Micro DQX 1500 For it's price it's a Rega killer as well. Recommended for all low budgets fan. 5 stars according to low price! 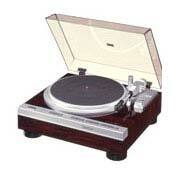 Garrard 401, EMT stuff, Voyd (auch a bad player!) so as the System Deck, most Micro and heard most Nottingham as well. Ease of use. Mates well with a variety of cartridges. Protects cartridges fromcareless handling. Tendency for the circuit board to burn out in my table. This review is for the Denon 51F not the 47F. I owned this table from new in 1983 until 2000. I found it to be a gnereally excelent vinyl player. Among the pluses: It is easy to set-up. Its automation reduces the risk of a cartridge's cantilever destruction from a momentary lapse in care. It can be adjusted to play all types of catridges-For the most part I used a Yamaha MC1, but also many moving magnets as well: Staunton 681EEE, Signet, Grado Signature. The down-side for me was this deck's three breakdowns in the 18 years. Once it stopped working under warranty,the circuit board burned-out. It burned out a second time about five years later after running extremely fast for a period. In 2000 it stopped running again and I chucked it in the trash. So, while I haven't read of other similar experiences, I have mixed feelings about recommending this turntable. Fairly low torque motor for a DD table. Very good quality, very smooth and quiet in operation. I am using a Grado Gold in it and the sound is very smooth and neutral. None of the exaggerations experienced with CD's. I do not like the integrated stylus force/anti-skating adjustment. I would prefer to set them seperately. All in all - a nice quality, good sounding table. With the right cartridge, a definite step up from CD's. The first I noticed hearing this player was;this is as good[or sometimes better]as my cdplayer[marantz72se]. Never thought a turntable could sound that good.you just have to feed it with good records and enjoy[amaze]youreself. One record I played:times like these,Gary Burton,sounds great,the vibraphone is sounding very natural and its like being life in my room.It`s nice to do some comparing between cd/lp.Now I stil use the Dl160 but a good mc will do fine on this turntable.A good point is also the lower freq.Bass is sounding deep and controlled. Rest of my system:Marantz pm16 amp. I've had this turntable for over 10 years, I've been extemly happy with its performance, keeps excellent speed control, due to a laser that keeps every thing in check. Nice stereo seperation, actually sounds better then most of my CD's. Plays 45s, or Lp's with the touch of a button. Combined with the Shure V15xVMR cartridge it's giveing me meny years of top quility playback. Just makes you wonder what a $10,000 dallor set-up would do. Probablly wet my pants. Wheres all the reveiws this table has been around forever. A beutiful peice of last generation audio. Buy one. Just look at the picture on the previous web-page! This isn't just a piece of audio-gear; this is a piece of craftmanship! Just put a piece of vinyl on this turntable, push the "start-button" and then watch the slow movement of the superb tonearm; this is ART! The sound (DENON DL160 cartridge) is so clean; it out-performs many CD-players! When you're the proud owner of some good vinyl, your LP's are worth it.